Free Valuation - No Obligation! FREEPHONE: 0800 321 3003 Request A Pack Today. Open 24 Hours! Request a FREE, insured G2P Pack™ return kit by completing the simple form on the right side of this page. Your Pack will be dispatched today! Place your unwanted gold, silver or platinum jewellery in our insured Freepost envelope. 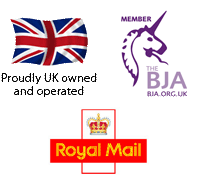 Take the envelope to any Royal Mail Post Office and send it to us special delivery at NO CHARGE! We receive most shipments the next business day. Gold2Pounds will make a cash offer for the contents of your pack the same day we receive it. Accept our offer and you'll get your money the next day by cheque or Money Transfer. FAST CASH, GUARANTEED! 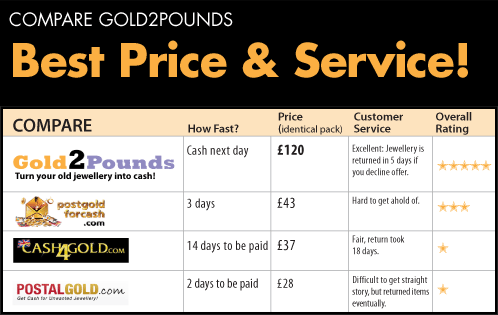 Gold2Pounds will offer you a fantastic competitive payment. Or We'll send your jewellery back straightaway at our expense. Fill out this form to receive everything you need to turn your jewellery into CASH! Free Valuation of your gold, silver or platinum jewellery. Simply fill out the form above and we'll send your everything you need to find out what it's worth. Deal direct wit the refiner. No Middleman! Our VALUATION SERICE is FAST, it's FREE, and if you don't like our cash offer we return your goods to you without delay! No charge! Get Cash forGold and precious metal scrap. We buy GOLD, SILVER and PLATINUM scrap. "Excellent, fast service from enquiring for info, through to receiving your very welcome cheque. Price is better than expected. Would have no hesitation in recommending your service." "This experience was brilliant and done in super quick time. I got my cheque in double quick time. I will be using Gold2Pounds again. Thank you." "I can highly recommend gold2pounds. They are very prompt, after sending in my gold they were that prompt I was still away on holiday, but as soon as I got in touch with them they sent me my money the next day. Didn't expect so much for so little. Great.."
"Very easy just send old earrings and broken chains very quick and easy."